I pay off her bills? My recent work has dispensed with persona. The longer I live in NYC, the more autobiographical it gets. One idea I have about this is that I had always wanted to live here but I was convinced that I didn’t have what it took, so in my mind this was a city of especially savvy people, a city of heroes—so being here I’ve become heroic, or the persona is now the hero named Stacy. The book I just completed is called Journal of Ugly Sites & Other Journals and takes up the idea of poetic journalism in different forms. The centerpiece is “Journal of Ugly Sites” which is a year-long journal I kept which documents, among other things, the life, illness and death of a Beagle that my partner and I rescued. Szymaszek’s small text plays off the mundane and even arbitrariness of its own format. Does the suggestion of a daily journal make much of a difference if begun in August or any other month? Gil McElroy’s ongoing lyric sequence “Julian Days” manages to bury specific dates by utilizing an unfamiliar calendar, the Julian Day Calendar, as poem-titles; he presents the dates, but they are unknown to the general poetry reader, and therefore, read as arbitrary numbers (one could look them up if one wishes, but I suspect only a rare few might). 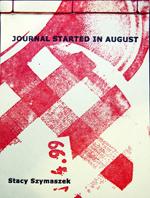 The temporal aspect of Szymaszek’s JOURNAL STARTED IN AUGUST is a curious one, with very little in the text to offer any kind of specific placement: if the journal really was begun in August, how long did it last—weeks or months or years—and does that even matter?